Premium deerskin palm and index finger. Gel pad in palm provides moderate impact and vibration protection and added wearability. Breathable spandex back stretches with hand movement. Wing thumb and shirred elastic wrist for snug fit. 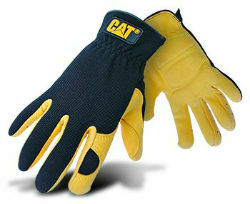 CAT® logo rubber patch on cuff of each hand.